Confirmed, Michael Shermer is a LIAR! A friend of mine on Facebook exposed an incredible case of outright deception from a man I once respected as a skeptic. Well, maybe the reason they seem so harsh towards you, Shermer is because they think you BETRAYED them! If only she were real and I was again a teenager, I would have been proud to be her boyfriend! While she is hardly perfect (which makes her realistic and thus acceptable to most TV viewers), she seems to embody more than most the Honorable Skepticism I follow. When Daria got her own show a few years later, she blazed a trail for cartoon characters few ever dared to go before, or since. 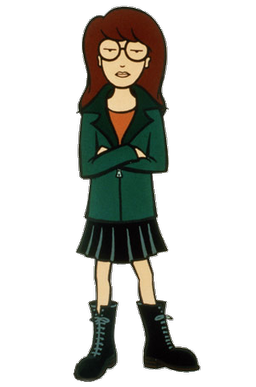 Yes, I was a lot like Daria when I was her age, except I was a born-again Christian. But otherwise I didn’t tend to follow the crowd, I was very into science, and I wore glasses. Today, I am even more like her, having dropped Christianity for agnosticism. While B&B were hardly role models for teenage boys, Daria is a great one for teenage girls! We need MILLIONS more girls like her, rejecting the shallowness of modern culture and embracing rational thought. Inspired by atheist YouTuber Steve Shives, here are five stupid things I have noticed about online scammers. They use pictures of extremely attractive female models to misrepresent themselves, instead of real photos of their actual selves. A simple search with Google often is enough to expose the fraud. They often claim that one or both of their parents died tragically, to make you feel more sympathy for them and to simplify their made up backstories. Gee, that’s a lot of orphans out there! They usually contact men who live in a different state or country from them. If you are really interested in a relationship, why not someone local? They demand money from their would-be victims even before meeting the target face to face. What hubris! When their demand for money is refused, they turn hostile. Gee, that’s not likely to get the love you supposedly wanted, eh?